Although it inhabits different parts of the market, Honda has always been the Japanese equivalent of Mercedes-Benz, a company that puts engineering first and is prepared to introduce innovations even if they do not promise an immediate profit. Honda's singular attitude has paid-off at different times when it had the best-selling cars in Japan and the United States but recently it hasn't seemed to do anything right. It was a pioneer with petrol-electric hybrids but now takes a distant second place to Toyota. The radically-styled Civic did not attract the new and younger customers that it sought. And although the Accord still sells well in America it is not the unassailable chart-topper that it once was. Furthermore, Honda fell behind in the area where it has always excelled: engines. With its record of technically brilliant small-displacement racing engines, we might have expected Honda to lead the new trend for downsizing but instead it found itself with the wrong combination of ageing engines to meet today's demands. Add to all this the devastation of the Japanese earthquake (which severely damaged the Tochigi R&D centre) and the disruption of components supply by the floods in Thailand and we can see why Honda might like to forget the past 18 months. But now things are looking up. Both the new Civic for Europe and the Accord in America are performing better than their predecessors. The first of the long-awaited Earth Dreams Technology engines have appeared and Takanubo Ito, Honda chief executive since 2009, has announced a five-year product plan that includes three types of hybrid, a mini SUV, and a Type R hot hatch version of the latest Civic. Amongst all this is a new fourth-generation of the CR-V, Honda's most consistently successful product in Europe and several other territories. The original CR-V launched in Japan in 2005 might have been the sister of the Land Rover Freelander but wasn't, because Land Rover engineers were not keen to share their technology with their associates at Honda, and then the Rover Group was taken over by BMW. As competitors, these two vehicles have vied for leadership in the UK's 'soft-roader' compact SUV market for many years. But while the Freelander continues to boast about its (considerable) off-road capabilities, Honda has never claimed that the CR-V is much more than a high-riding family car. I have attended the press launch of several CR-Vs and don't recall once being encouraged to drive off the beaten track. As if to reinforce this point, the latest model was launched in southern Germany, a country where off-road driving is positively discouraged. It is surprising, then, that while there has been a two-wheel drive Freelander for a couple of years, only now is the CR-V available with front-wheel drive only. All of the previous generations have had Honda's unique hydraulic 'dual-pump' system to distribute power to the rear wheels when the front ones start to slip. For the European and US versions of the new CR-V, the dual-pump is replaced by a wet clutch pack at the rear differential which is activated electronically and gives faster response, weighs less, reduces internal friction, and works in concert with other electronic systems including VSA stability control and HDC hill-descent braking. The only version available to us had four-wheel drive and the 2.2 litre i-DTEC diesel engine introduced in the previous model in 2009. But since all the driving was on dry, high-grip metalled roads, conditions under which the car operates only with front-wheel drive, we can guess that the two-wheel drive variant would feel exactly the same in normal use. Power and torque of the 2.2 diesel (150PS and 350Nm) are unchanged but fuel consumption and therefore CO2 emissions have been improved by 10 per cent. A CO2 figure of 153 g/km is pretty good for this class but the displacement of 2.2 litres is out of step with the competition. The 'Earth Dreams' 1.6 litre diesel can't come soon enough; this lightweight four-cylinder with 120PS and 300Nm (and 94 g/km CO2) will be offered in the Civic from January and the CR-V later in 2013. 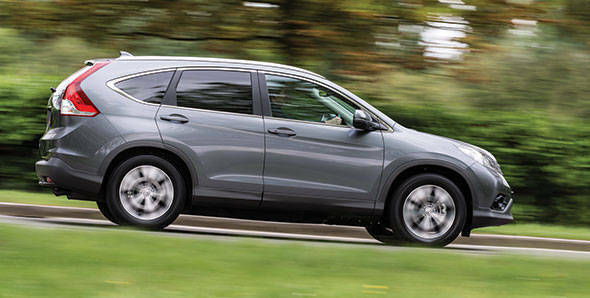 With the current engine, the CR-V has been made more civilized and car-like; refinement and noise insulation are exceptional for a diesel-engined SUV. Electric power steering, as fitted to other recent Hondas, and an idle-stop system (with the manual six-speed, not the five-speed automatic transmission) help further improve fuel efficiency. The European model, made at Swindon in the UK, has subtly different styling to those sold elsewhere. It has the 'Y shaped' face of the latest Civic and more clearly sculpted body sides. The overall shape is smoother than before; the 30mm lower stance, and the flat underfloor, has improved its aerodynamic performance by 6.5 per cent. The suspension is carried over from the old model but differently tuned. The set-up is ideal for the smooth roads of Bavaria but we wondered if it would feel too stiff for comfort on the bumpy and broken roads often found elsewhere. The new CR-V is actually 5mm shorter than its predecessor but has notably more room inside and the largest cargo volume in its class. The one-step fold-flat system for the rear seats  you just pull a tab for them to spring forward and fold down - is nothing short of brilliant. Electric closing for the substantial tailgate is standard. The driving position is comfortable, the gear lever high up and conveniently close to the wheel, and forward visibility is good but the fascia isn't as well planned as the Civic's. Oddly, the 5-inch screen at the centre has a small repeater display for navigation instructions directly above it (instead of in front of the driver). In terms of price, Honda has positioned the CR-V between the Korean soft-roaders like the Hyundai i35 and Kia Sportage and the premium compact models from Audi, BMW and Land Rover. With its good reputation for reliability and dealer service, this new model should do well  particularly when the 1.6 litre diesel arrives to complete the package.